Bike & Walk Morristown is pretty excited to be teaming up with Marty’s Reliable Cycle to kick off Elly Blue’s Dinner & Bikes, the 2014 East Coast tour on Sunday, June 1. 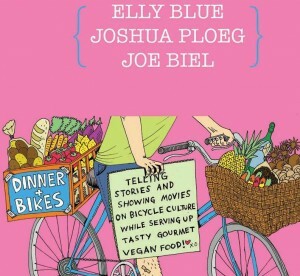 Elly Blue will be talking about her new book Bikenomics: How Bicycling Can Save the Economy. Tickets are on sale right now at Eventbrite for $25 or pick yours up in advance at Marty’s Reliable Cycle, 173 Speedwell. Elly Blue was the fan favorite at the National Bike Summit this year and publishes zines and books about all aspects of bike transportation and writes helpful columns, like this one on Six Things You Don’t Need to Start Biking. Joining Elly in Morristown is Joe Biel, who will be showing a series of his short films about bicycle activism and culture. His newest shorts focus on the family bicycling movement. Along with these two, we are lucky enough to have Joshua Ploeg, the traveling vegan chef, who will be preparing a gourmet vegan dinner; this tour celebrates the release of his newest book This Ain’t No Picnic: Your Punk Rock Vegan Cookbook.